The aim of the FAQ section is to answer questions about Text2Talk that we receive on a daily basis. If this does not answer all your questions please do not hesitate to Contact us. Q: How can I enter the Activation code sent, later? A: Simply, login to your account as usual. It will take you to activation, automatically. Q: What is the cost going to be? A: Text2Talk calls are 5 cents per minute to anywhere in North America. Q: How Text2Talk handles roaming charges? A: If you are not in the neighborhood of your area code, you will pay for roaming. It is unavoidable. It is a question of 'how much'. At Text2Talk, we minimize the roaming charges, as well. For example, if you have a 416 number and you are in Oakville (905) at the moment, you are in roaming. In such case, if you place a call through Text2Talk, our system calls you from Oakville, 905. Not from Toronto, 416. Less roaming, that might be saving of 5 dollars or more, depending on the length of the conversation. Q: What should I do when I pick up the call? A: Text2Talk is sensitive to human voice. In order to connect you, it needs an human interaction. You should say 'hi' or 'hello' (louder is better) to let the system recognize you. Q: What happens if my credits are running out? A: When your account balance gets low you will receive a top up reminder text message. Q: How can I buy additional credits? A: You may buy credits with Visa or Master Card credit cards or a PayPal account. All purchases are via PayPal, but you do not need to have a Paypal account to top up your Text2Talk account. Q: I do not have text messaging on my phone. Can I still use Text2talk? A: Yes. You can initiate Text2Talk calls via our website, www.text2talk.ca. However, to get the maximum advantage from Text2Talk we strongly recommend you talk to your mobile service provider to activate text messaging service on your cell phone. Q: Is Text2talk a local service? A: No, not at all. 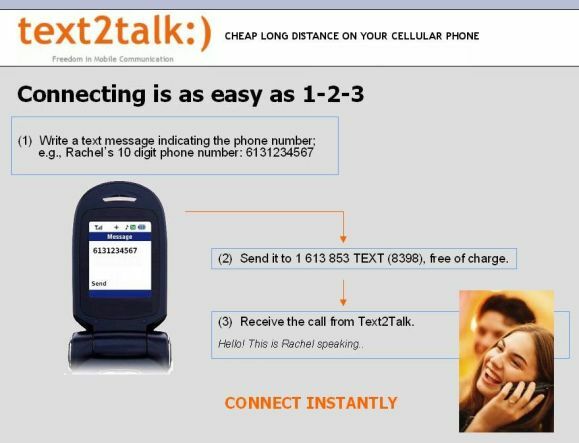 Text2Talk works from and to anywhere in North America. Q: Can I call landlines from Text2Talk as well? Q: How does it work with Text Messaging? You are done,... Your phone will ring instantly. Pick up the call, say 'hello' and talk to your friend, mother or relatives in seconds. Show me! Q: Can I register my landline at Text2Talk to get the advantage of 5¢/min and avoid hidden fees of other long distance carriers? A: Yes, you can. Simply register it, and contact us for activation.